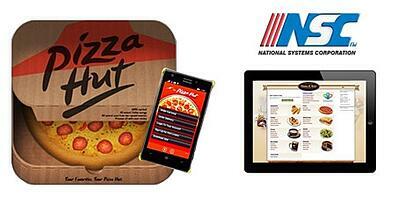 National Systems Corporation is a leader in providing call center and online ordering support to the quick-serve food industry. Pizza Hut relies on NSC to process hundreds of thousands of pizza orders daily, with peak events like Superbowl Sunday and Halloween driving order rates to 20 orders per second or more. NSC agents work from call centers around the world as well from their homes. When a customer calls Pizza Hut to order, that call is routed to an available agent who then creates the detailed order which is transmitted via satellite to the local Pizza Hut’s point of sale (POS) system. Pizza Hut requires NSC to maintain five 9’s of reliability; that is, 99.999% up time, allowing for total unscheduled down time of no more than five minutes annually. The VB6-based, desktop application developed for agents to handle calls was cumbersome to install and support across so many different user platforms. After internal review of all the options available, they turned to Mobilize.Net to modernize the 78,000 lines of VB6 code, converting it to HTML5 for simple and flexible web deployment. Using Mobilize.Net to convert source code automatically can be 4X less expensive than a ground-up rewrite. Additionally, new code on average contains 10-50 bugs per 1000 lines of code (KLOC). As always, Mobilize.Net was able to provide NSC with a fixed-price project with a guaranteed delivery date, which they hit. Now NSC agents can use the call center application with little or no IT support and work from any connected device. Supporting more than 6500 locations NSC is one of the market leaders in delivering state-of-the-art computer telephony integration (CTI) systems to call centers, corporations, and businesses of all sizes. Headquartered in Chicago, Illinois, National Systems Corporation offers complete systems, service and support to a wide variety of customers ranging from your local pizzeria to some of the most sophisticated call centers in the world. With a combination of brick and mortar and virtual call centers in multiple timezones from the Phillipines to Alaska and across the U.S., pushing orders to more than 6500 locations, NSC found installing and supporting a desktop version of their call center application to be difficult and expensive. A browser-based, hosted (SaaS) solution was the ideal solution for this application. To modernize their critical TMS application, NSC first reviewed all options and decided on Mobilize.Net’s WebMAP offering to convert their existing code base. The project involved creating an exact version of the existing application in HTML5 so it could be deployed as a SaaS application and be available from virtually any browser on any platform. Converting 78,000 lines of VB6 source code on a fixed price, fixed delivery date schedule was no problem for Mobilize.Net, who relied on the two decades of experience converting millions of lines of source code to more modern platforms. To avoid dependencies on external service vendors, NSC provides their own application hosting solutions. The end result? A more efficient, easily deployed call center application that required no re-training of existing agents and which is re-tooled to handle future requirements.